Nothing is quite as kingly as a lion, a comparison likely drawn because the lion is the so-called king of beasts. 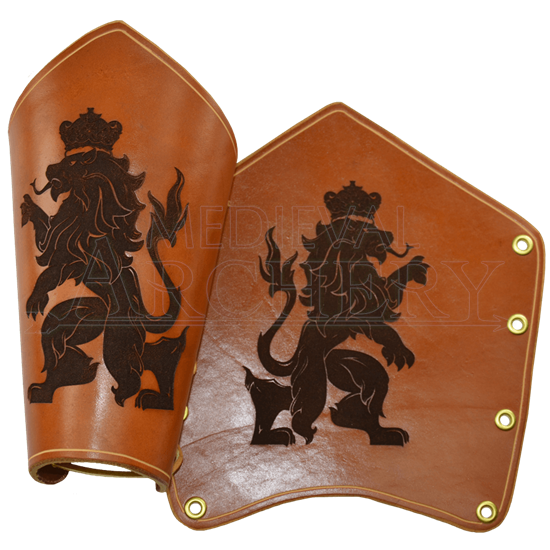 And in the Rampant Lion Leather Bracers, you not only feel like a king, but a king fit to go into battle and show his foes his claws. Made from high quality leather, the bracers come in two varieties, depending on whether you choose the heavy, armor-grade 13/15 oz. leather or the light, flexible 7/8 oz. leather. Both are made exactly the same. One is just more for wearing and decoration while the other is appropriate as an off-handed armor. The bracer is decorated with a rampant lion wearing a crown. A rampant lion is a lion that is rearing up onto his hind legs and prominently displaying its talons. Along the left and right side of the bracers are eyelets, through which the provided leather lace can be threaded. Doing so provides an easy and secure way to wear these bracers comfortably for any good periods of time. They may not make you a king of the jungle or a king of beasts, but the Rampant Lion Leather Bracers will certainly make you look and feel like a powerful warrior-king.